Of course, you don’t need to be fooled by the top line predictions, because there’s going to be great opportunities for smart buyers this year right around Australia – particularly if you’re a buyer. Outlined below is a summary of views on the year ahead. Louis Christopher, from SQM Research forecasts that Australia’s housing market will likely record further dwelling price falls, driven by a deepening housing downturn in Sydney and Melbourne. SQM’s base case forecast is for dwelling prices to fall between -6% to -3%, which is a continuation of the current falls of 4.5% over the past 12 months. Sydney and Melbourne will drive the falls. Other cities will record mixed results with Hobart expected to have a third year of strong price rises of 5% to 9%. The base case forecasts assume no changes in interest rates, a Labor win at the next Federal Election with negative gearing repeal and CGT changes coming into effect 1 July 2020. If SQM Research is correct on the Sydney and Melbourne forecasts, it will mean by the end of 2019, the peak to trough declines will be at least in the order of 12% to 17% for these two cities. Click here for more information on the 2019 Boom and Bust report. Domain Research House, from domain.com.au, recently published their overview of market performance and price forecasts for 2019 – 2020. Domain Research state that 2019 looks likely to be a year of greater stability. They acknowledge prices may fall further in some areas, but the pace of those falls will slow in the first half of 2019 before we move into another moderate growth phase. Domain Research expects Sydney and Melbourne will be two of the weakest markets in 2019 and then forecast prices to grow at about 4 per cent in 2020. Brisbane, Perth, Adelaide and Canberra will see modest house price growth over the next couple of years and Hobart house prices should stabilise after rapid growth in recent years. Click here to see their comprehensive report. KPMG Economics published an update to their research paper on housing affordability for Sydney and Melbourne in mid-January. In broad terms, KPMG Economics expect real median prices for Sydney residential property to continue to soften until June 2019, then bottom out in the following 12 months and then moderate growth between July to June 2021. Their analysis shows that dwelling prices in Sydney are much more sensitive to the demand created by domestic investors than dwelling prices in Melbourne. KPMG believes it is predominantly this factor that is causing the difference in expected dwelling price growth between the two markets. Generally, KPMG expects Melbourne residential property to experience about half the real median price decline of that in Sydney to June 2019, before increasing by around 2.4% by June 2020, and 4.7% by June 2021. Based on their dwelling price forecasts, the peak-to-trough adjustment in real prices for residential property is expected to by approximately -13% in Sydney and -5% in Melbourne. Interestingly, the report makes a comment about the potential impact of Federal Labor’s proposed changes to negative gearing and capital gains tax, if it wins the next Federal election. Click here to download a copy of the report. 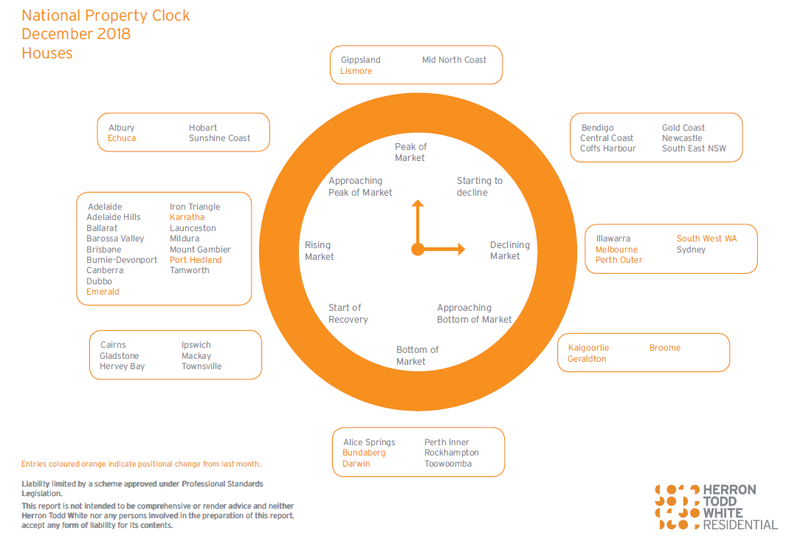 See below for a copy of Herron Todd White’s ‘property clock’. Remember the key point that the property market DOES NOT move in a clock like fashion . . .so the information below is just a perspective on HTW’s view on where they see each main area sitting. Remember also, this is a very top line view, so there will be opportunities and pitfalls in all the areas listed and to identify the gold you will need to look at performance indicators at suburb and property level. Each forecaster references Federal Labor’s planned changes to negative gearing, where negative gearing will only apply to newly built property. All acknowledge Labor needs to be elected first, and then have the changes approved but all seem to expect this will be a highly likely change on the Federal scene. There’s mixed views as to whether the changes will have an impact on the market, although all seem to point to a fall in prices or very limited impact. For example, KPMG states they believe “the policies are unlikely to distort the investment mix, although it could have ‘some’ impact on investment in dwellings for rental purposes”. In KPMG’s view the policies are ‘sound’. At Crave, we believe the majority of forecasters and economists are completely off the mark and have missed a glaring negative flow-on from the change. Leaving negative gearing on new property only will create a new class of property in the Australian market. It will drive the prices of new property UP, and will therefore negatively impact the people Labor say they want to help – first home buyers. In addition, it will make property investing in this ‘new class’ extremely risky as unsuspecting investors will be caught in the trap of property spruikers who are currently paid huge commissions to push new property sales. This legislative change has a very large shadow of corruption about it. That is, if this kind of change was introduced at local government level, we would all be looking closely at the councillor (or Mayor) who introduced the change . .and would no doubt find a trail of cash linked to the pay off. It wouldn’t be the first time senior politicians were found to be corrupt, or at least misled by heavy handed lobbyists, and no doubt it won’t be the last. This change is similar to the poorly constructed NRAS offering which took the cash hunting element of the property industry about a week to figure out how to fleece money from unsuspecting investors. If there isn’t someone who has received a big bag of cash for introducing the policy as a key Labor platform, then it seems Labor is completely misguided. I’m not sure which is worse. Crave Property Advisory is a unique property strategy and buyers agent service. As the only independent and unbiased advisory that can help you use any property strategy Australia-wide, Crave’s services extend to home, investment and commercial property. A highly client focused organization, Crave developed the Modular Investing System (MI System) to provide clients with the ability to use a tailored mix of strategies and efficiently build profitable portfolios that create lifetime income. Debra Beck-Mewing is the CEO of Crave Property Advisory, and has more than 20 years’ experience in property investing, Australia-wide. She has used a range of strategies to build her property portfolio including renovating, granny flats, sub-division and development. Debra is skilled in identifying development opportunities, and sourcing properties that have multiple uses and multiple exit strategies. She is a Qualified Property Investment Advisor, licensed real estate agent and also holds a Bachelor of Commerce and Master of Business. Follow us on facebook.com/CravePropertyAdvisory for regular updates, or book in for a strategy session to discuss your property questions.